The Amarnath caves, dedicated to Hindu Lord Shiva – a sanctifier and supporter of good and destructor of evil, are 5,000 years old shrines in the northernmost state of Jammu and Kashmir in India. Within the cave, Lord Shiva is resembled in the form of an ice stalagmite, the Shivling. In this word, Ling has been derived from two words namely Leen meaning to dissolve and Gati meaning to grow. Therefore, the meaning of the word Shivling is that the man should stay dissolved (Leen) in the Lord Shiva and then he should grow (Gati). The miraculous ice pillar grows on its own during May to August and then slowly wanes, which is according to the moon’s phases. There is around four to five ice formation among which that of the Shiva is the highest. To his left is that of his son – Lord Ganesha ((the Lord of Wisdom and Prosperity)), while on the right is that the Parvati, Shiva’s wife, and Bhairava (God of Courage). Located at 145 km away from Srinagar, the cave is at a height of 3,888 m above the sea level. Due to this geographical location and unfriendly weather, the route to this holy cave is unreachable from September to June due to snow covers. Therefore, the Amarnath pilgrimage from Srinagar or Kashmir is only permitted from the period of July to August. Even after this, the route is arduous and the peak’s height and low temperature can make it further tough. However, this has not affected the people’s faith due to their unflinching devotion and belief in Lord Shiva. Due to terrorists, the Central Reserve Police Force, Indian Army, and Indian Paramilitary Forces have tightened the security due to which prior permission for pilgrimage is required from the Government of India. There is a mysterious story behind the discovery of this cave. According to this story, a Sadhu (saint) gave a sack of coal to a Gujjar (type of tribe) shepherd named Buta Malik. Amazingly, instead of coal, the shepherd found gold coins in the sack when he opened it. In no limit to his happiness, the shepherd went back quickly to thank the Sadhu. However, when he reached place where he met the Sadhu, the Sadhu had disappeared and instead, he found the divine cave and the sanctified lingam. He publicized this event to all the villagers and from then, the cave is revered as the sacred shrine of Shiva. There is another story to this discovery according to the ancient epics. According to this story, the current valley of Kashmir was actually a big lake in olden days. Kashyap Rishi, the grandson of Lord Brahma (creator/father of the Universe), drained the lake water via multiple rivers and streams. At this time, Bhrigu Rishi had come to visit the Himalayas. This sage was the first to worship the Holy Cave. He then told about this lingam to the people. 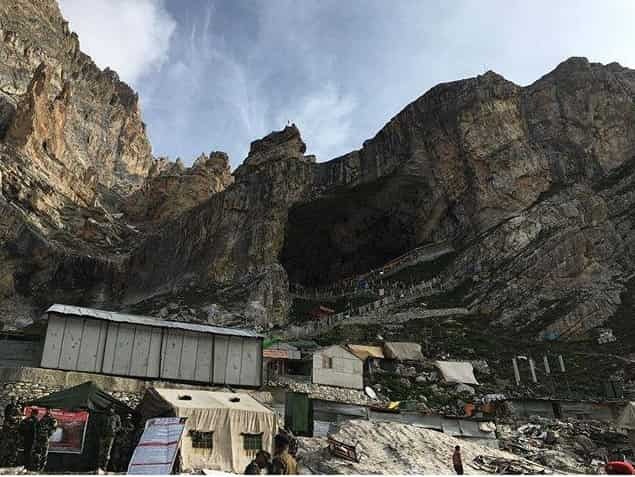 Since then, Amarnath is regarded as Shiva’s abode and lakhs of devotees come for pilgrimage despite arduous terrain for obtaining eternal peace and joy. There are two legends famous behind the significance of this holy cave. Considering the Hindu mythology, it was in this holy cave where Shiva revealed to his divine wife, the top secret of life and eternity. Crores of years ago, Goddess Parvati asked Lord Shiv – Bhole Shankar, her divine companion, to explain the reason of wearing the beads of heads (Mund Mala). Shiva answered that whenever you take birth, I insert one more head in my mala. Then, the goddess said, “My Lord, my body is destroyed every time and I die again and again, but you are immortal. Please let me know the secret of this.” As a reply, Lord Shiva said that this happens due to Amar Katha. Maa Parvati insisted for the life’s secret repeatedly. However, Lord Shiva continued to postpone it for a long time. Lastly, on persistent request, he decided to reveal the immortal truth. To tell the truth, Lord Shiva began to look for a lonely place where no living being can heed the immortal tale. In his quench, Lord Shiva chooses the Amarnath Cave. He began his journey towards the cave. On the way, at Pahalgam (Bail Gaon), he left his Nandi, the bull for his ride. Next, at Chandanwari, he took out the Moon from his locks (Jataon). Going further, at the banks of Lake Sheshnag, he took out his snakes usually found around his neck. Then, he left his son Ganesha at the Mahagunas Parvat (Mahaganesh Hill). Next, at Panjtarni, Lord Shiva left the Five Elements from which a living being is made up of namely, Earth, Water, Air, Fire, and Sky. He is regarded as the God of these elements. A popular belief is that both Lord Shiva and Maa Parvati performed a Tandav dance to commemorate sacrificing the materialistic world. After making himself free from all the worldly things, both divine souls entered the holy Amarnath cave. Then, Lord Shiva took Samadhi on the skin of the Deer and began to meditate. Next, he ordered Rudra named Kalagni to lit fire to discard any living being in or nearby the cave so that no living being can hear this tale. It was now that he started explaining the reason behind the creation of life and this world to Maa Parvati. However, by chance, one egg was underlying the skin. While Shiva was explaining this to Parvati, unknown to them, two mating doves from this egg eavesdropped in between to learn the secret and tend to dwell in the cave forever. These doves are reborn again and again and have made the cave their perpetual home. Many pilgrims on their way have seen and reported the doves-pair despite no vegetation being around the cave. This is truly an unbelievable miraculous truth in the history of this cave. Even today, you can see these two doves when you trek for pilgrimage in August. There is another popular legend behind this cave. According to the legend, Lord Shiva gave the celestial nectar of immortality to all the heavenly gods to make them immortal. This act of Shiva bought him an award of the name Amarnath, which means one who is eternal and immortal. Since then, Lord Shiva also means Lord of Immortality and hence the cave dedicated to him. There are two routes to this cave. One is the traditional route from Pahalgam and the other is from Baltal. From Pahalgam, the cave is at 46 km at the end of the Lidder valley. Actually, it used to start from Srinagar that is 117 km away, but now a shorter route is taken through Chandanwari. Prior to the Journey, a puja (religious ritual) is performed at the Shankaracharya temple in Srinagar from where the pilgrims take a rod (mace) named Chhari Mubarak up to the cave. Trekking is the only way to reach the cave. The trek from Chandanwari holds spiritual importance. You will come across the following halts or beautiful scenes. Is a mountain of seven peaks looking like a head of a snake? Other attractions are the glaciers and lakes. This is at 12 km that goes down to the next stop. This is the last camp of grasslands from which the cave is at 6 km. It is recommended to start early due to long distance and queues of people in Darshan. If you do so, you can return to Panchtarni by lunch and Sheshnag by night. If you are a dedicated devotee with an immense sea of faith within you, this holy pilgrimage journey will definitely prove fulfilling to you. This is an isolated area and it is for those who do not want crowd. Baltal is a village in the foot of Zojila Pass at a distance of 15 km from Sonamarg. However, this route is steep and is slippery during the visiting time in August or monsoons. It takes a day to reach the cave via this route and so there are many teal stalls and Langar (big kitchens) at Brarimarg, Sangam top, and Do mail. The rout at the Sangam top coincides with the Pahalgam route. You can take up a pony ride to reach the cave available at the standard rates. When the ice Shivling is at its peak on the full moon day in August (Hindu holy month of Shravan), lakhs of Hindus and other tourists reach the cave to worship the amazing lingam by trekking from Pahalgam.